A “Class of 1968” inductee, Chuck Scherza was one of the team’s most beloved players. He ranks second all-time in games (649), third all-time in assists (297), fourth all-time in points (436) and ninth all-time in goals (139) in Reds’ history. 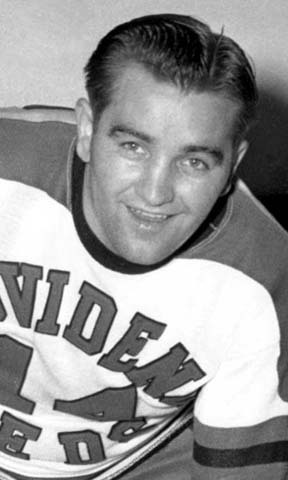 A skilled but no-nonsense hockey player, Scherza also racked up 539 PIM during his 10 campaigns with Providence from 1945 to 1955. He also won a Calder Cup with the Reds in 1948. In two NHL seasons from 1943-1945, this rugged forward registered 12 points and 5 goals in 36 games. Chuck was inducted into the Manitoba Hockey Hall of Fame in 1993.